Safe using,matte eyeshadow palette without any harmful ingredients, it's nickel-free, lead-free, cadmium-free and anallergic. 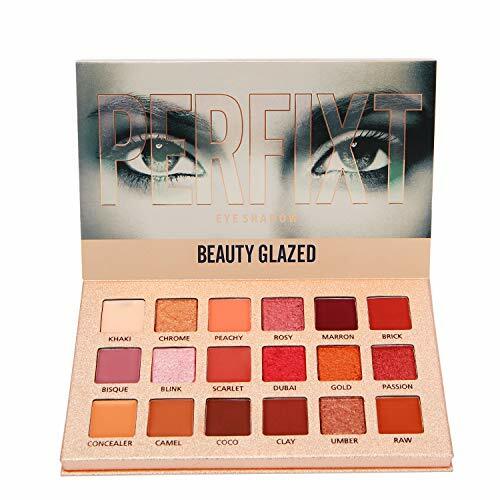 This multi-pan eyeshadow palette offers everything you need to create neutral looks, add in pops of color and play with brights. The hues are carefully selected to be universally flattering to any skin tone or eye color. With the rich range of matte, shimmer and glitter finishes in colors, you will be inspired to create endless looks suited perfectly for any occasion. All the shades can be used dry for easy blending or wet for more intense, vibrant color. The darker shades can even be used as eyeliner when used wet. To apply wet, damp the brush and shed off excess water. Dip into a dark shade and apply gently. When used wet, it is recommended to use an angled brush. Apply a proper amount of highlight to the entire eyelid and then contour the edge of the eyelid with darker shade and blend. Apply the transition shade on the eye socket and brow bone. * Prep the eye area with eye concealer for a long-lasting result. * Tap off any excess on the brush when applying matte shades. * Use ring finger to apply the shimmer to amp up the glamour.